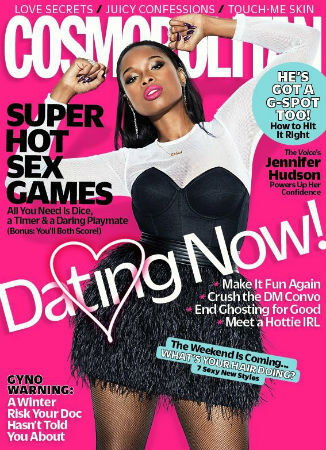 -What’s happening with Jennifer Hudson’s Cosmo cover? Is she dancing? Is she fighting? Also, I haven’t read Cosmo in decades but all of those headlines are hilariously bad. -The Queen won’t let Kate Middleton wear nail polish? Man, I can’t wait until Megan Markle shakes this up. -HBO is dropping its project with news analyst Mark Halperin amid sexual-harassment allegations. -Mandy Moore says she met her husband on Instagram, so keep on double tapping all the latte art photos that cute guy you don’t actually know posts. –Ashley Judd, who was one of the first women to go on the record and kick this whole Weinstein story off, spoke with Sawyer about her experiences on Good Morning America. -In EW’s new cover story, insiders get really candid about why this moment in Hollywood is very different. -This Sarah Polley profile is all kinds of wonderful. -Here’s the trailer for the David S. Pumpkins animated special. -The cast of Ryan Murphy‘s latest TV project is insane. Pose will star Kate Mara, James Van Der Beek and Tatiana Maslany, as well as the largest number of transgender actors in television history to have series regular roles. -Was the set of Practical Magic cursed? -Here’s the first trailer for Marvel’s Runaways, which critics are loving. I’m definitely here for anything that puts Buffy’s Spike back on my TV.